There has been a Kestrel pair in the territory around two nest boxes. The pair have been checking out both nest-boxes, perching around them, and going inside the boxes. Yesterday (March 26) and today there has been another Kestrel pair flying over one of the nest boxes. In response the resident pair spent a lot of time on one of the nest-boxes, went inside about three times each as well as copulating on the nest box and the top of the building. Neither of the pair actually landed on a tree or the nest box that I saw, but kept flying over the area of the nest box. Today the new pair of Kestrels was back and this time the new male landed on a tree while the resident pair was perched together at the top of the building. The new male then flew and perched on the top of the nest box. In response the resident pair flew from the top of the builing causing the new male to fly away. The male perched on top of the nest box and the female flew inside the nest box. The new pair stayed in the area for most of the morning and the resident pair would fly after them. There have been several more copulations today between the resident pair as well. It is interesting to me that this new Kestrel pair is so persistant and I wonder how long they will remain in the area. While I had nest boxes up in this area last year, this is time a Kestrel pair has set up territiory let alone attracting two pairs. I also have two nest boxes up about 150 yards apart just to give the Kestrels an option and my intent is to remove the un-used box after the resident pair selects a nest box. This is cool information. How much territory does a kestrel pair need in your area to raise a brood? How far will the "losing" pair have to go to find a different nesting site? 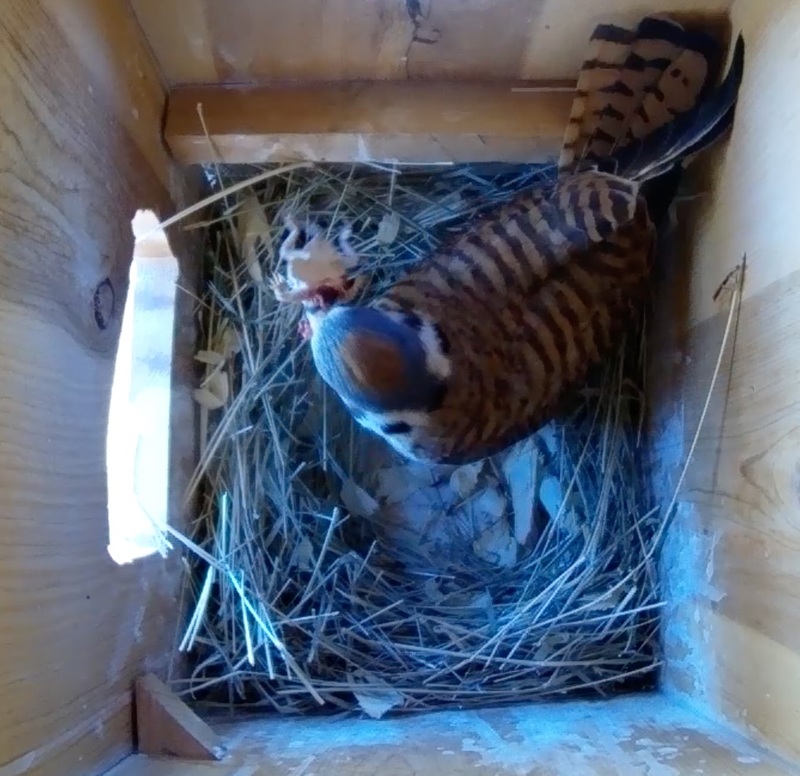 The American Kestrel Partnership recommends boxes being 1/2 mile apart. I put these two boxes up knowing that they were within the same 1/2 mile Kestrel territory, but I wanted to give the Kestrels an option. The site was new last year and there were no Kestrels in the area until after breeding season. I replaced one box with a modified one and placed a new box in an area where I saw a lot of Kestrel activity. On another note the resident male and female were the only ones around today, but it was cold in Northern Colorado with a rain/snow mix. The female went into the nest box twice this morning and spent a few minutes in there each time. She is also very good at catching rodents as I saw her eating one yesterday and one today. It looks as if she is going to choose the nest box closest to the office which will give me and a lot of people wonderful views of them flying, hunting, and the current courtship behavior. The office is new and has huge windows so we are able to see a lot of their behavior. Below is a picture of the nest box from the window. On March 30th, weather cleared and became warmer. The resident pair were hunting in the area, perching on the nest box, and defending it from another kestrel in the area. The pair spent a lot of the day chasing the new kestrel away and defending the nest box. The extral Kestrel remained in the area from about 8:00 am until 1:30 pm. Long copulation session on top of the nest box and the female spent several minutes inside the nest-box. It seems probable that this will be the chosen nest-box and I suspect egg laying will begin in the next few weeks if not sooner. How exciting! I think I also had more than one kestrel pair competing for my box. I know I had at least 2 males flying around the female. I'm trying to figure out how to tell if the male is the same one as last year. Do you know how persistent the markings are through seasonal moltings? These adults are not banded so I can't use that as a distinguishing characteristic. We banded two hatchlings last year, but have not seen them since they fledged last summer. No I do not know if variations in feather patterns remain after molts, though this is an interesting question. I wonder if someone who has American Kestrels either in rehab or in falconry, could answer this question? I would imagine that people that have banded a bird and noticed unique differences might be able to answer this as well. In my situation I have named the original Kestrel pair as the resident pair and most of my observations are based on behavior (where they perch, hunt, and favorite perches for consuming a rodent). We had some cold weather here and the Kestrel activity slowed down and there are times when they are not around. I expect the female will choose a nest site soon and settle in for the nesting season. On the first day most of the time the other pair was around they never landed, just flew around the resident pair. On the second day the new male kestrel landed in a tree, while the resident pair were perched on top of the building. The new male then flew and perched on the nest box, as a result the resident pair flew to the nest box with the male landing on top and the female perching below the entrance hole. I have been away from the office most of last week, and it was cold and snowy on Friday, but this next week is supposed to warm up so it will be interesting to see what Kestrel activity I n0tice. I am hopeful that they will use one of the nest boxes so I can continue to record activity that I see. I hope you have a pair nesting also. Great picture and thank you for sending it along. I would like to have a camera in the nest box someday, but for now I will have to settle for external observations. 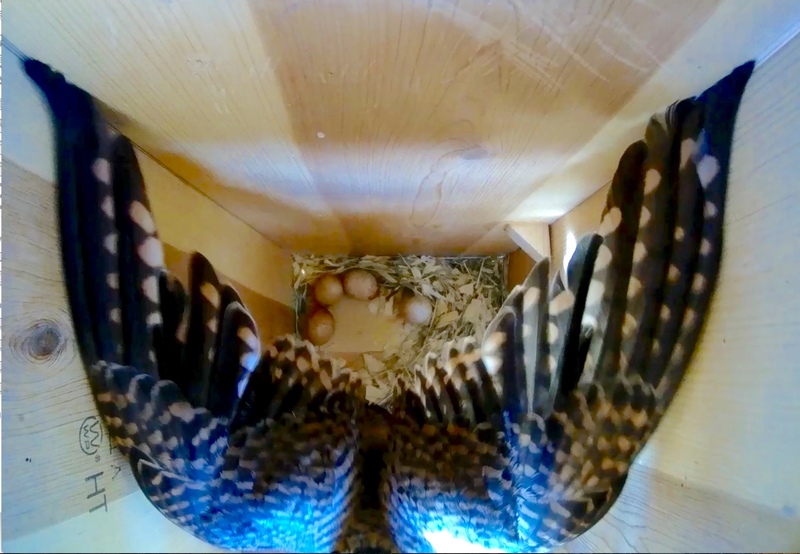 It sounds like you have a kestrel pair that are going to nest and congratualtions it is interesting to see the lizard, but that makes sense. In Colorado they have been catching a lot of rodents. The female spent most of last Thursday the 12th, perched on the Southern nest box closest to the building. I am sure she is going to pick this nest box and the male I included a screen clipping from a video where the male was perched on the roof above my head and flew down to the female on the nest box. After a long copulation session, they perched together until an insect flew in front of the nest box and I got to see the male fly off the nest box, grab the insect, fly to a tree and eat it. 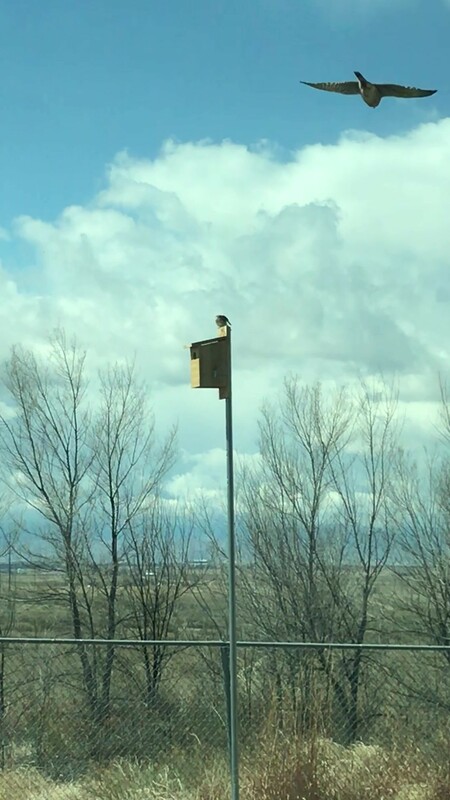 It has been great to see Kestrel behavior and there are many other people in the office that are way more interested in Kestrels now, which I hope allows me to put up more nest boxes and do more for them. I would love to have a Kestrel nest box close to home but I live in a small city, so I have nest boxes for song birds and have been working on different versions to allow native birds and exclude House sparrows. Please continue to share your nestbox photos and info. Gosh! Good luck excluding those pesky house sparrows--they are so persistent! And what a nicely captured photo of the kestrel flying. I reiterate that having no way to watch kestrels at work is probably a good thing for me. I'd get nothing done, most likely. :) But it is so nice that you've been able to inspire more kestrel fans there. Maybe others who live more rurally will be interested in building kestrel boxes for their property. Colorado is perfect habitat for kestrels. I grew up a bit south of Colorado Springs and my folks still live there, so I get up there occasionally. A nest box camera is great, but getting a good one can be spendy. We got ours used on eBay, but requires power--ours is actually a security camera and powered by ethernet cable (POE) but I think it enables photos of very decent quality. If you do get a camera, I'd suggest a northfacing window, covered by plexi or some plastic. You can see the difference before and after we cut the window. These photos were taken a week apart. I'm also pasting my favorite photo from last April. Great pictures and I can see why that is your favorite. I think that it is interesting that they are laying on a bald spot. I expect that the female has started laying, but I wont check until sometime after May 1st. I actually have been away from the office at training this week and wont return until next Monday, so I am anxious to see what is going on. I would love to have the camera inside the box to better view bird behavior. I am very interested in bird behavior and trying to make sense of what I see. This is why I modified the Kestrel nest box and have created three different nest box options for Black-capped chickadees. I have been keeping a running narrative of what I have seen at both the Kestrel nest box and the BCCH nest box. I finally made the move to record this info on a blog and I have included the link below if you want. I would be interested to see more photos of when you notice the first and subsequent eggs. Thank you for all the work you are doing to help kestrels and for sharing. Darn! Not getting your Wordpress page to load. Would like to keep up with your blog. Do I need an account? Posted in General Discussion by Sparrowhawk 1 year 3 weeks ago.